In order to create our exclusive overview of the largest hedge funds of the world, we took a deep dive into the hedge funds industry. We compared company filings, spoke to experts and read tons of news reports until we were able to select the world’s top 50 hedge funds. Chosen wisely, we included those funds with the most assets under management (AUM) and most renowned investment managers. Next to well-known hedge funds, we revealed secret funds as well. If you aim to get an valuable overview of the most important hedge funds of the world in order to track them or get in touch with them you are absolutely right here. Karl Karsten describs many of the key principles of today’s hedge funds that are still valid in two published books. He founds a small fund and pursues an investment strategy in accordance with his “hedge principle“. It leads to buying stocks that are expected to rise and short-selling stocks that are expected to fall. Alfred Winslow Jones creates a “hedged fund“: A.W. Jones & Co.
An article about the success of A.W. Jones’ fund introduces it as a “hedge fund“. Many new hedge funds emerge in this period, among others the popular Quantum Fund by George Soros (1969). The rise of hedge funds stops and many high losses are registered due to the oil crisis and the following recession. The abolition of capital controls in the 1970s and the deregulation and liberalization of financial systems in the 1980s in the UK and US enable new investment opportunities. These developments encourage other Western countries to follow the American and British initiative. New hedge funds emerge. With over $ 250 billion assets under management, the hedge fund industry exceeds the highpoint until then. Hedge funds consistently generate positive returns while major stock markets decline. Because investors believe that they are not correlated to major stock markets, they tend to increasingly invest in hedge funds. Until 2007, the hedge fund industry exponentially grows by other $ 500 billion in less than two years. The hedge fund industry manages to balance the losses and outflows due to the financial crisis. The hedge fund industry reaches a new all-time high of $ 2,190 billion assets under management. 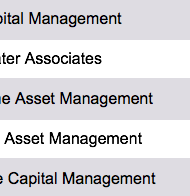 The hedge fund industry reaches $ 3.5 trillion assets under management. Source: Fichtner, Jan (2013). “The Rise of Hedge Funds: A Story of Inequality”, pp. 4ff. Get Our List of Research Activist Firms For Free! On top of our exclusive top 50 hedge funds list, we are also offering an overview of the world’s most important research activists. These firms are conducting investigative research of stock-listed firms. Before publishing devastating research reports, they are shorting the respective firms. Muddy Waters LLC is one famous example for research activists: their reports crashed the stock market courses of Ströer or Asanko Gold. Getting to know the most important activists and potentially tracking them is a true competitive advantage in financial markets. Even though we’ve spent months of research, we cannot promise that there are no funds which are actually larger than the listed firms. Therefore, we promise free updates and extensions within one year. You will save a lot of time spent on exhausting research. 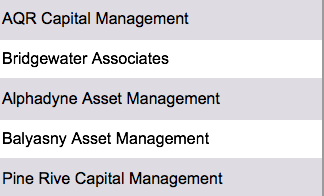 Our list offers detailed information about the most important hedge funds. We are happy to help you with any requests and to assist you with your individual research tasks. In case of any questions, or if you want to receive a preview file, do not hesitate to contact us via email to contact [at] researchgermany.com or via our live-chat. Certainly, we are happy to support you when establishing contact to German companies or to create custom-tailored lists on demand for you. Also, discover our Top 250 Venture Capital Firms of the US now.